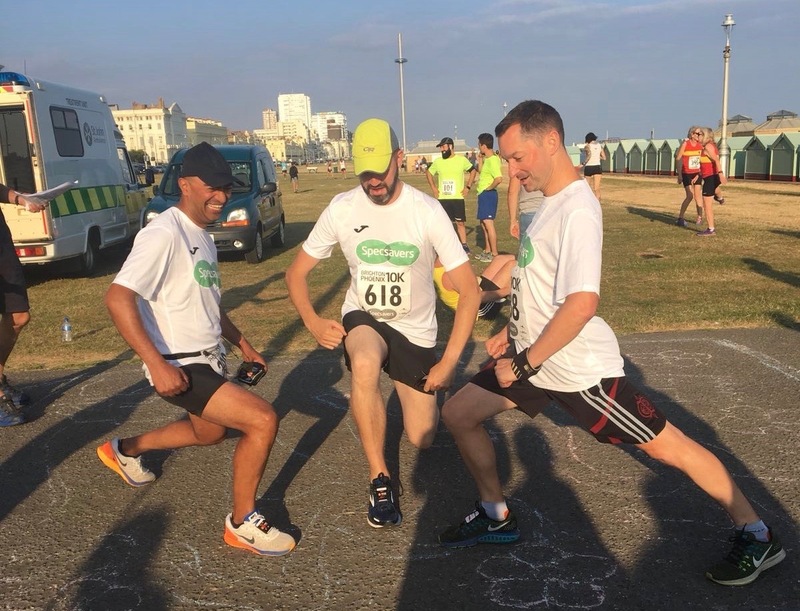 Badrinath Mohandas, left, from Specsavers, Uckfield, is pictured stretching with colleagues before the Phoenix 10k in Brighton. Store director Badrinath Mohandas is a familiar and friendly face to customers at Specsavers in Uckfield and Hailsham. But if you spotted him in Brighton one sunny evening this July, you would have had to run pretty fast to keep up with him. That is because Badrinath was taking part in the Phoenix 10k run along the seafront with three colleagues from Specsavers Brighton – and he finished the race in an impressive 42 minutes and 13 seconds. The annual race donates half the money raised to The Clock Tower Sanctuary, a homelessness charity based in central Brighton. After the race, Badrinath met the Mayor of Brighton and Hove, Councillor Dee Simson, who had come along to support the race. Badrinath said: ‘I really enjoyed taking part in the Phoenix 10k. It is a terrific race, and raises so much money for such a good cause.